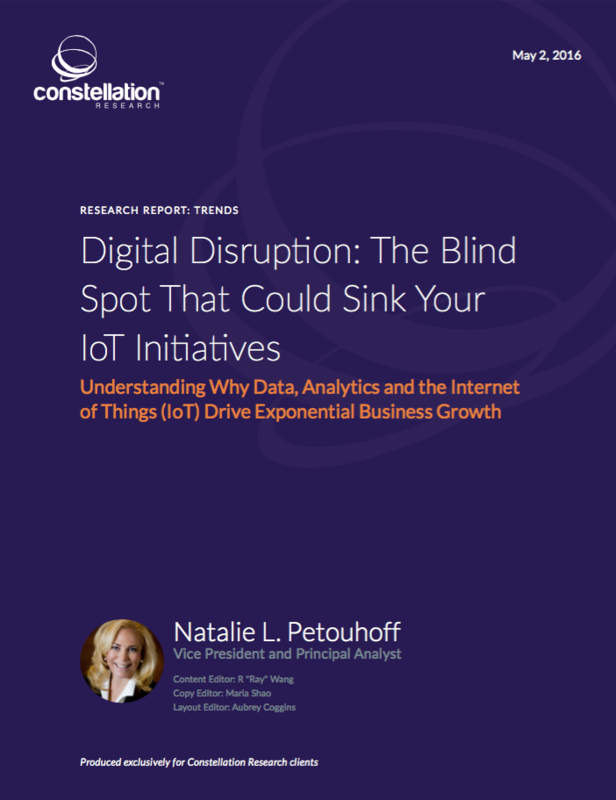 Digital Disruption: The Blind Spot That Could Sink Your IoT Initiatives | Constellation Research Inc.
Companies continue to harvest and analyze vast amounts of data for growth, competitive advantage and operational efficiency. At the same time, the Internet of Things (IoT) is commanding many of the headlines. IoT holds great promise to streamline previously untapped amounts of data, using analytics to turn the data into intelligent insights and actionable outcomes. While there are many trends in how businesses are starting to use the IoT, executives who want to truly understand why it can be so significant need to examine the exponential business growth models driven by the IoT. Linear business models, in which growth rates have not changed for decades, is the norm. But exponential business growth models are emerging in which companies grow at extraordinary rates. This report examines the exponential nature of change in today’s growth models and how the prospect of exponential change is blindsiding many businesses and even putting IoT initiatives at risk. With IoT nipping at their heels, executives need to examine how they are running their businesses and understand the context of why it’s important to change their thinking about how to expand a business.